The health issue is unknown and it's unknown how long Park will be away from the team. The Iowa State Cyclones take on the No. 3 Oklahoma Sooners today in Norman, and they will have to do so without their starting quarterback. 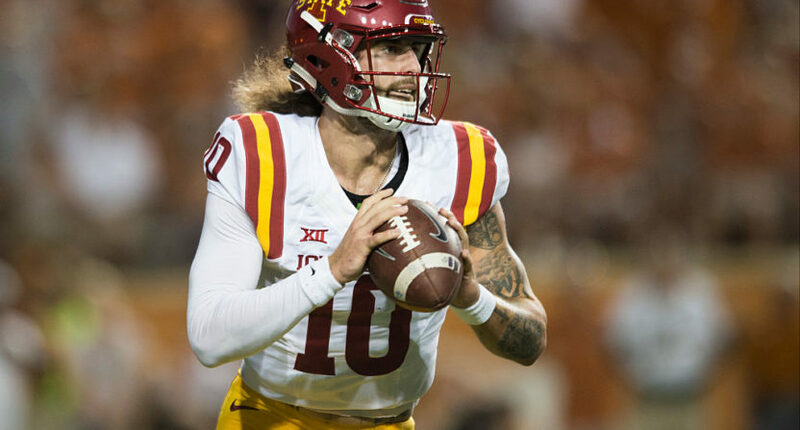 Cyclones head coach Matt Campbell said in a statement Friday night that quarterback Jacob Park has taken a leave of absence as he deals with “personal medical concerns,” according to Tommy Birch of The Des Moines Register. Park is still on the team, Iowa State officials confirmed to the Register, but will not play Saturday — and potentially beyond — as he deals with unspecified medical issues. It’s unknown when Park will return, and it’s unknown who will even be the Cyclones’ new starting quarterback. The redshirt junior has thrown for 1,181 yards, nine touchdowns, and five interceptions on the year. Park has had an incredible college football journey that began with him enrolling at Georgia (after being a top recruit), where he never played a down. He then transferred to Trident Technical College (South Carolina), and they don’t even have a football program. The Des Moines Register says that while at Trident Technical College, Park kept in shape “by playing in a church football league with friends.” He then transferred to Northeast Oklahoma A&M and joined their football team, but never played a down there either. Finally, he ended up at Iowa State last season, and took over as the starting quarterback towards the end of the season. Hopefully Park’s health issue is nothing major and he can get back on the field soon to help the Cyclones.